Uxor Henrici JEFFREYES de Home Castle Armig. Filia Edwardi PITTS de Kyre Wyard Armig. 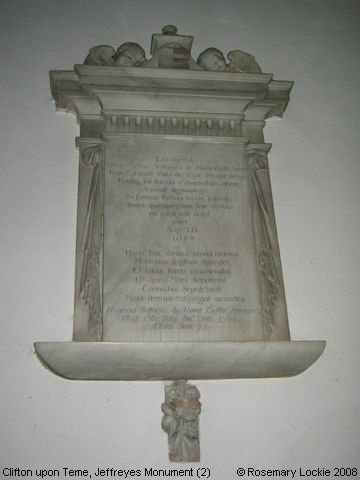 The guide leaflet says this monument was by Grinling GIBBINS, and the only example of its kind in the country. It was erected in 1689 at a cost of £40m and is of Italian marble. The agreement, and receipt for the work is still extant, and includes Gibbins's signature, and the signature of the Vicar of the time, Thomas CREMER.